I love just about anything made with pumpkin. From my favorite creamy, “I can’t believe this is good for me” pumpkin pie smoothie shake that literally tastes like pumpkin pie in a glass to pumpkin pie, pumpkin tea, pumpkin muffins and a whole slew of pumpkin recipes I plan to try this fall…pumpkin rocks! It’s gotten some not so positive press this year due to the FoodBabe’s investigation of the ingredients in Starbucks’ Pumpkin Spice Latte (but if those are your thing, at least there are healthier recipes out there for how to make them yourself!). Because I like to focus on the positives when it comes to our health and what we eat, here are just a few reasons pumpkin is so good for us and we should eat more of it! Loaded with the antioxidant beta carotene, which the body converts to Vitamin A for healthy, glowing skin, strong vision, and to boost our immune system. Contains anti-inflammatory compounds that reduce the risk of developing diseases like heart disease and arthritis. Great source of potassium, an essential mineral we need to keep our hearts and muscles working at their optimal levels. 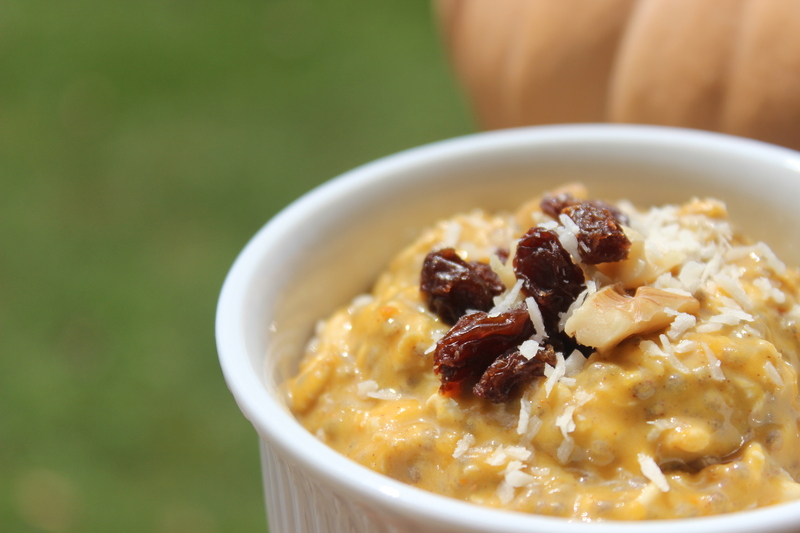 A few weeks ago, I made some “berry” quick overnight oats, and due to all of the positive feedback you shared, I wanted to try round 2 and make pumpkin-based overnight oats. If you like the flavor of pumpkin and all of the wonderful, warming spices of fall, then you have to try this recipe 🙂 The longer I let it sit in the fridge, the more the flavors melded together. Seriously guys, this stuff is deeelish! This will keep in the fridge for 3-4 days, so you can make up a few ahead of time and enjoy them throughout the week! In a pint-size (16 oz.) mason jar, combine pumpkin puree, chia seeds, spices, 1/2 tablespoon of maple syrup and vanilla extract and whisk until evenly combined. 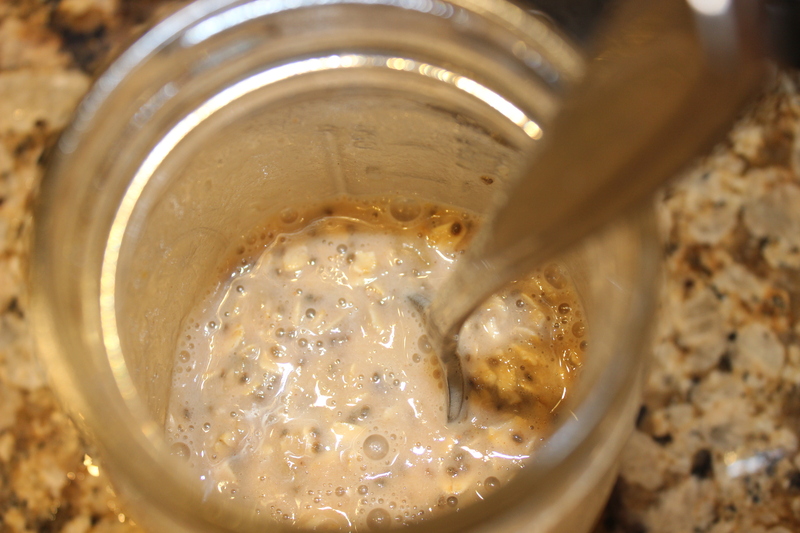 Add oats and almond milk and stir with the whisk or spoon for about 30 seconds, so it combines evenly. Cover with a lid and leave in fridge overnight or for at least 1 hour. Add remaining 1/2 tablespoon maple syrup and any additional toppings or mix-ins. A tablespoon of almond butter makes it even creamier! Most mornings, Bill and I have a smoothie for breakfast. We pull recipes from this list and from my “Blend It Up” Pinterest board. 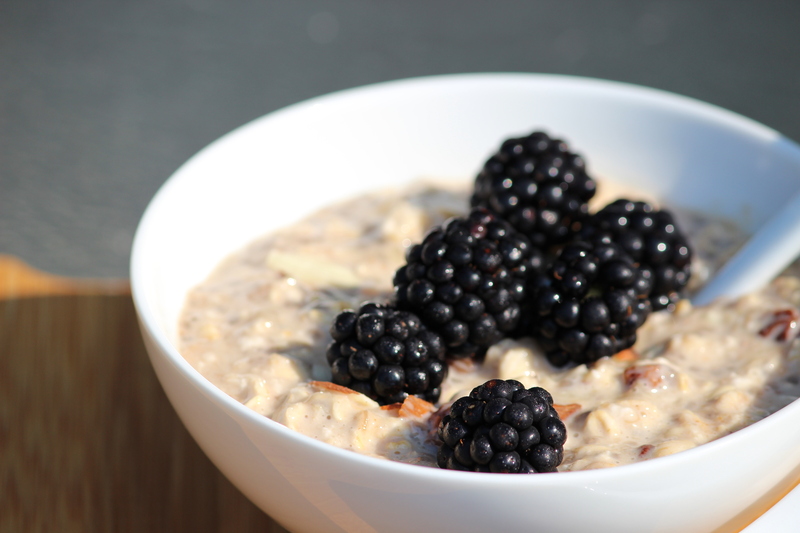 Today, I’m putting a new spin on a classic favorite – oatmeal! You don’t even have to cook it. It’s one of those set-it-and-forget-it recipes that takes the hassle out of breakfast! I used to eat oatmeal every day for breakfast because it’s a pretty quick, easy, and healthy meal. 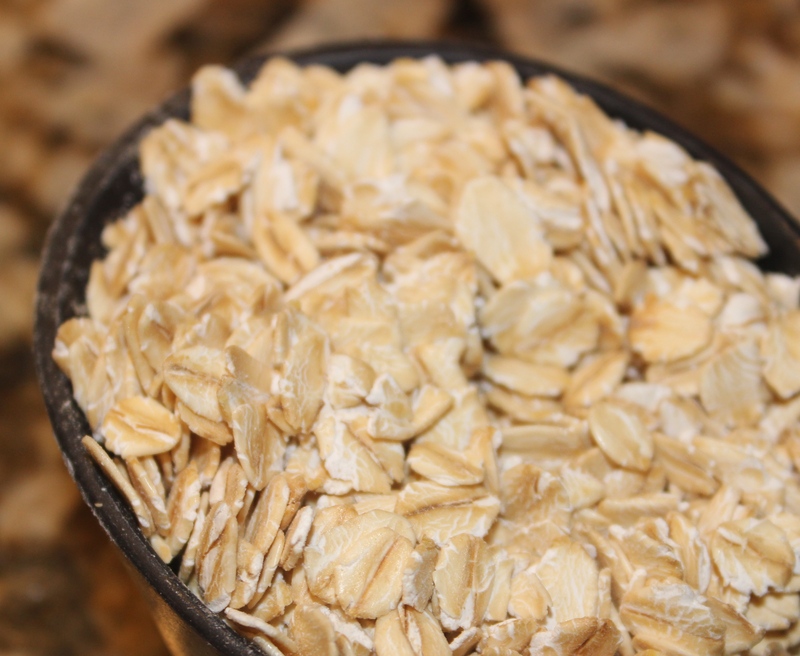 Oats have tons of health benefits, too! 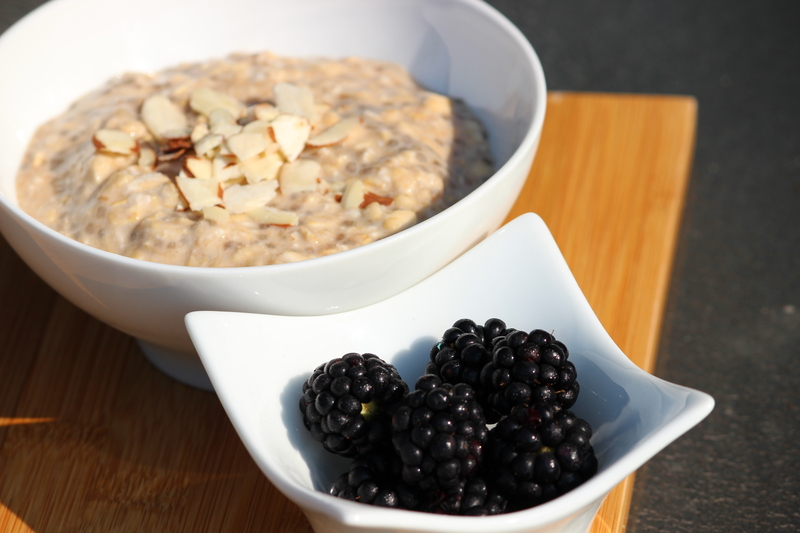 The way I usually make oatmeal is by cooking it slowly in a pot on the stove…but that’s not always the most convenient thing to do, especially in the morning, so I tried something new. My friend Jess and I made a variation of an overnight oats recipe a few months ago when we did a cooking demo for a group of her employees. After browsing through several other recipes online, I came up with one that I REALLY like! I’ve already made it twice this week, and it has come in handy on mornings when I’ve been pressed for time. 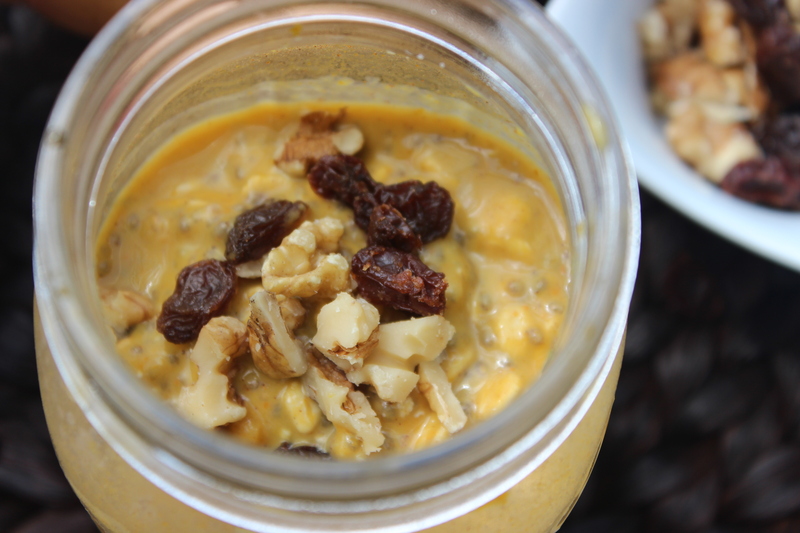 This overnight oats recipe takes less than 5 minutes to put together and is healthy, tasty, convenient grab-and-go option, perfect for when you’re feeling rushed in the morning. All of the ingredients magically come together while they’re chillin’ in the fridge and you’re catching up on some sleep. One thing I love about this recipe is that you can prep several jars at once and have breakfast ready to go for a few days in a row. That way, you literally don’t even have to think about what you’re going to do for breakfast in the morning. All you have to do is open your fridge, grab a jar, and hit the road! The possibilities for combinations of spices and add-ins are endless, so experiment with it to find what you like best! Feel free to share below if you find a combo that you really like! 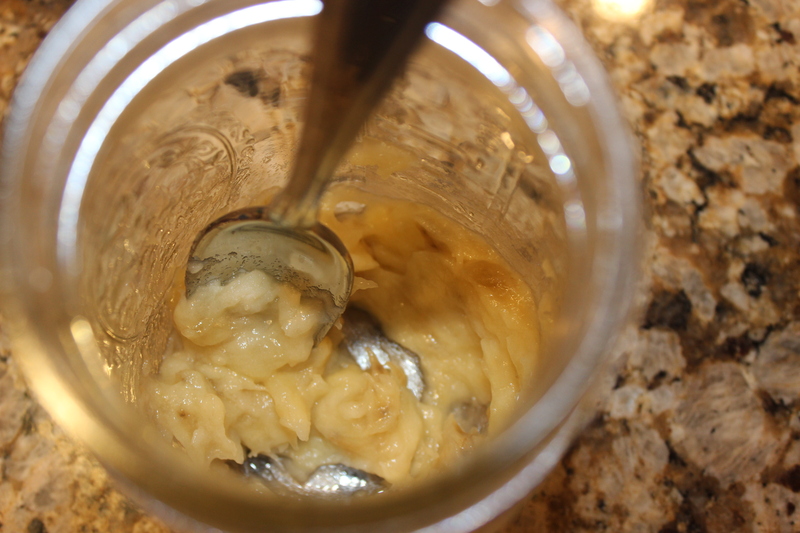 Mash the banana in the bottom of a mason jar or mug with a spoon until it’s the consistency of applesauce. OR pour applesauce into bottom of jar. 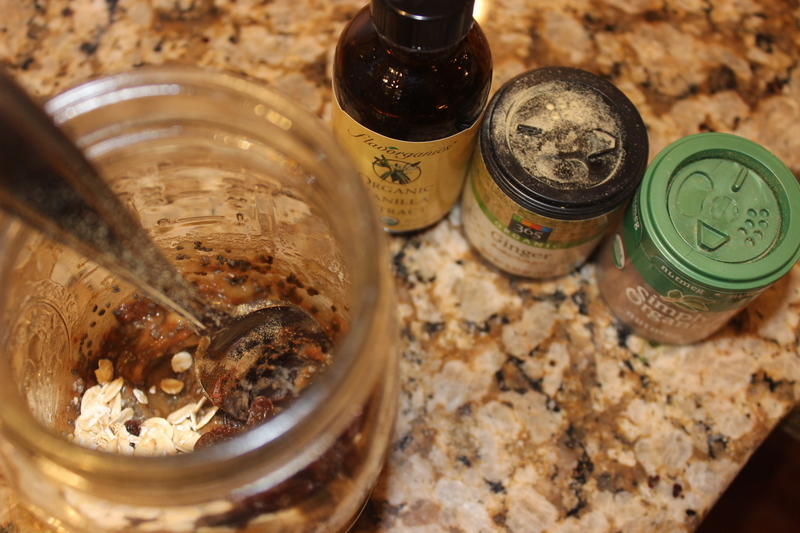 Add spices, chia seeds, salt, vanilla, oats and raisins to banana mash and stir to mix everything together. Add almond milk and stir until all ingredients are combined. It will seem watery. That’s normal! 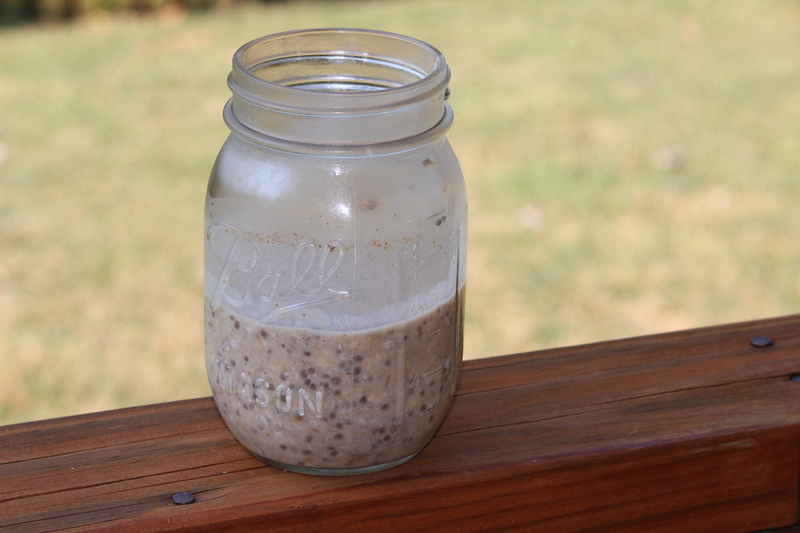 The chia seeds and oats will absorb the liquid, and it will thicken up overnight, so just give it time. Store jar or mug in the fridge overnight, and everything will gel together. 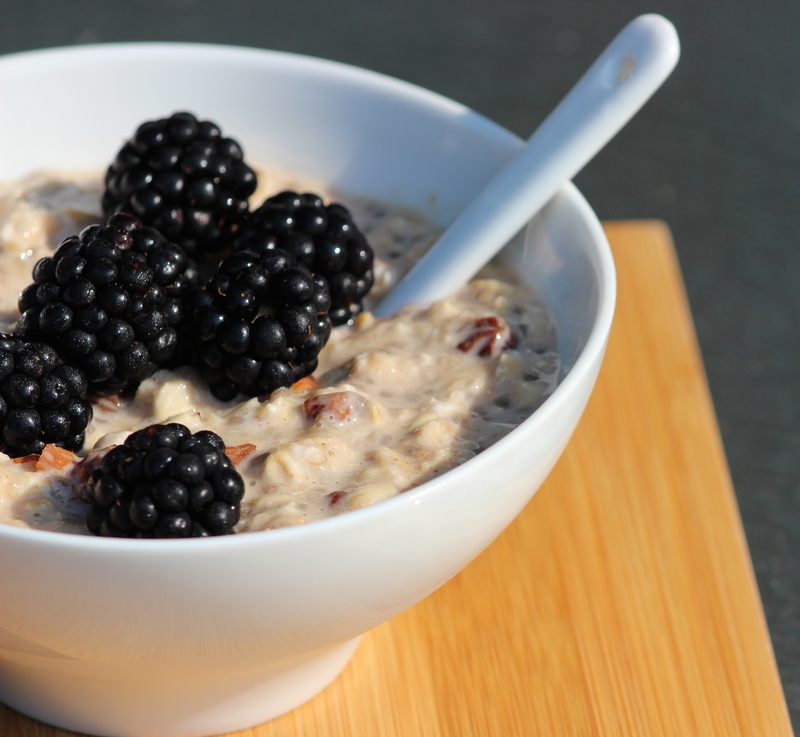 Remove from fridge in the morning and top with or stir in your choice of nuts, seeds, nut butter and/or berries (I used slivered almonds and blackberries!). Optional/additional add-ins: 2 teaspoons almond butter or peanut butter, shredded unsweetened coconut, or sliced bananas, peaches or any other fruit you like!